This is a really great steamer from Sunsella. It’s really easy to use. Put your veggies inside the steamer and then lift up the sides to cover the veggies. Then you can put the steamer down inside the pot to allow to steam. I like that this one is adjustable to you can fit it to the size of your pot. It’s got a ring in the middle that makes it really easy to remove. I hate struggling to try to get them out of the pot and this one is super easy. I just get a hold of that ring with a hook and then pull it out. I love steamed veggies, now that I’m eating healthy this is a must have in our house, we use it all the time and I love the results. The holes in the side allow for even cooking and it works really well. Diameter 5.3 inches to 9.25 inches – Height range (legs included) 2 inches to 3.35 inches. 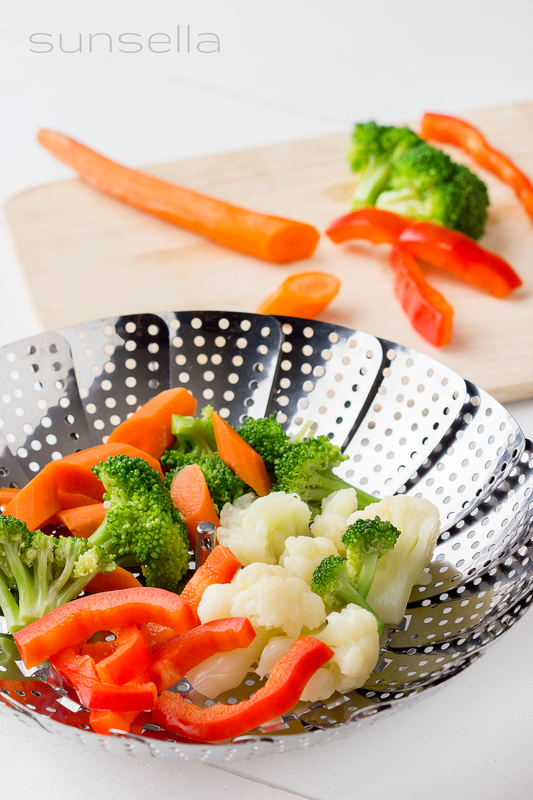 You can purchase this steamer on Amazon! I am really loving all these new silicon baking products!! I have always loved to bake and whenever there are new products I just get so excited. However, these new silicon cupcake liners are one of my new favorites. They are so convenient! They work just like any other cupcake liner except since they are made of silicon they heat evenly so you don’t have to worry about burnt edges. Also I don’t know about you guys but I take recycling and doing our best to preserve our land very important and these are a great way to do that. Now instead of using paper liners that are just going to go in the trash you can reuse these silicon liners over and over again. 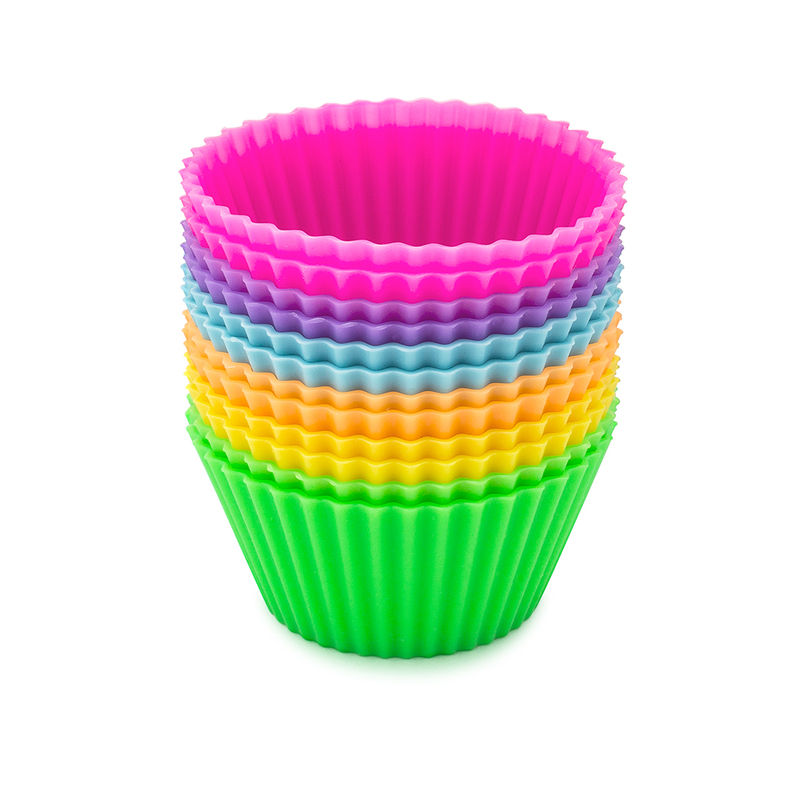 They are dishwasher safe so you can just pop them right int he dishwasher when you are done eating the cupcake or muffin out of it and then reuse them next time! The high quality material keeps things from sticking which I love. I don’t know many times I’ve tried to eat a cupcake and only get to eat half of it because half is stuck to the paper. I’ve also been using these as snack cups for my 5 year old. She loves all the colors and it keeps her snacks easy to carry around and keep track of. I highly recommend these! Free 10 Cupcake Recipes Ebook (digital download) – 100% money-back lifetime guarantee! Premium quality silicone. Guaranteed to pass the “twist-test”. BPA, phthalate and lead free. Meets FDA standards. Dishwasher, microwave, freezer and oven safe. Highly durable and reusable. Easy to clean, non-stick, stackable, space-saving, no waste, economical and environmentally friendly. They can handle temperatures ranging from -40′ to 446′ F (-40′ to 230′ C). Diameter top 2.6 inches (6.7cm), diameter bottom 1.78 inches (4.4cm), height 1.3 inches (3.4cm). Make sure to visit them Online too!